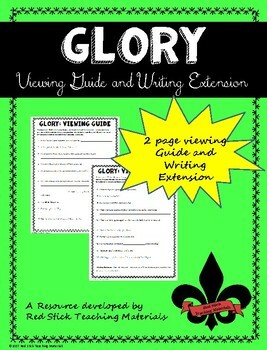 This Viewing guide gives teaches a quick and easy way to hold students accountable while watching the film, Glory. This activity is NO PREP! 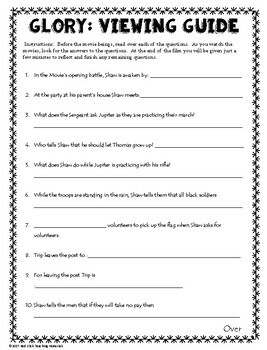 All you have to do is print, make copies, and show the film. 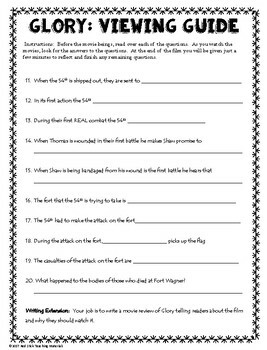 In addition to the fill-in-the-blank format, There is also a template for students to complete their writing assignment that is a part of the guide. Remember to follow my TPT store to be among the first to be notified when new products are available. Also, earn TPT credits for future purchases when you leave feedback! Please note, the movie Glory is rated R, has war related violence and strong language. This movie may not be appropriate for your class. Please watch the film before you purchase this guide to determine appropriateness for your classes.